St. Louis Zoo gun demonstration: court blocks open-carry rally. 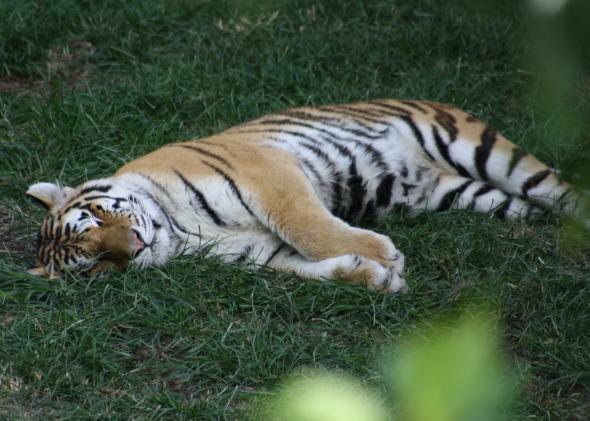 An unarmed tiger at the St. Louis zoo. On May 31, Jeffry Smith called the St. Louis Zoo and demanded that it remove its “no weapons” signs from the entrances. Smith also insisted that the zoo officially change its policy to permit visitors to bring firearms on the premises. The zoo refused. Smith promptly scheduled an open-carry demonstration inside the zoo for June 13, 2015. The zoo went to court seeking a restraining order barring Smith from carrying out his event. Now, just a day before the planned demonstration, a Missouri court has granted the restraining order, explicitly forbidding Smith and his fellow gun enthusiasts from marching through the zoo with their weapons. Smith, however, seems likely to push back in court, since he believes the Missouri constitution gives him a right to carry his gun virtually everywhere—even in a zoo filled with wild animals, families, and children. And he might actually have a case. In 2014, Missouri voters overwhelmingly passed the Missouri Right to Bear Arms constitutional amendment. This amendment guarantees an “unalienable right of citizens to keep and bear arms,” and commands that “any restriction on these rights shall be subject to strict scrutiny.” To pass strict scrutiny, a law must further a “compelling governmental interest” and be “narrowly tailored” to further that interest. Does a ban on guns in a zoo pass strict scrutiny? Maybe, but it’s not a slam dunk. Keeping families safe from gun violence is undoubtedly a compelling governmental interest—but it’s easy to imagine more narrowly tailored ways to achieve that goal rather than a blanket gun ban. For instance, the zoo could require that all guns on its premises have trigger locks or have their firing pins removed. Of course, the easiest way to prevent gun violence at the zoo is probably just to keep guns out of the zoo. But strict scrutiny forecloses any possibility of such a simple rule—at least without vigorous justification. If the idea of a court forcing zoos to justify such a seemingly commonsensical ban makes you queasy, I’m afraid I have some bad news. In 2014, the Sixth Circuit Court of Appeals ruled that the Second Amendment requires all gun laws to be subject to strict scrutiny. If the Supreme Court ultimately agrees with this logic, then every single gun restriction in the United States will have to meet that incredibly stringent standard. The age of gun-free zoos could quickly become a distant memory.